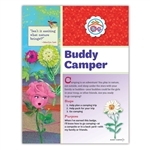 Daisy Girl's Guide to Girl Scouting Welcome to the Daisy Flower Garden. In this journey for kindergarteners and first-graders, a favorite pastime-gardening-meets the Girl Scout Law. The result is a storybook world of flowers and little girls who, together, do great things. Girl Scout Daisies will especially enjoy meeting the colorful, global characters who teach them to live the Girl Scout Law. Journey Book has 88 pages. In this journey for kindergarteners and first graders, Girl Scout Daisies join their flower friends for an exciting road trip in a flower-powered car. As they travel the country living the values of the Girl Scout Law, girls and their flower friends enjoy what's local and learn why that's important. They experience what is great about what grows near them, and they learn how their own special skills make the world a better place. 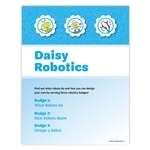 In this journey, Girl Scout Daisies enjoy a fictional story about their flower friends. They learn just how much they can care for animals and for themselves and how confident that makes them feel. Imported. How To Guide - Journey Book Sets The companion How To Guide for adult volunteers offers key information about the journey, its awards and its leadership benefits, and step-by-step sample plans for how journey sessions can unfold as girls meet. The adult guides also feature sections on Girl Scout history as well as understanding girls at each grade level. Each "How To Guide" / Journey Book Set has everything adult volunteers need to enjoy this amazing journey. Just bring your enthusiasm and sense of adventure. How To Guide and Welcome to the Daisy Flower Garden Girl's Book. How-To-Guide Journey Book Set. Each companion guide for adult volunteers offers key information about the journey, its awards, and its leadership benefits, along with step-by-step sample plans for sessions with the girls. The adult guides also feature Girl Scout history, tips for getting out in the great outdoors, details about how to add your own "bells and whistles" to the journeys in partnership with girls, and unique activity sheets. Imported.